We all know the importance of washing produce, especially with all the chemical sprays and such that farmers use these days. But did you know that there are at least 5 different ways to remove pesticides, dirt and bacteria from produce? In fact, not all of them are recommended, although they still remain popular today. Do you really need to wash all produce? 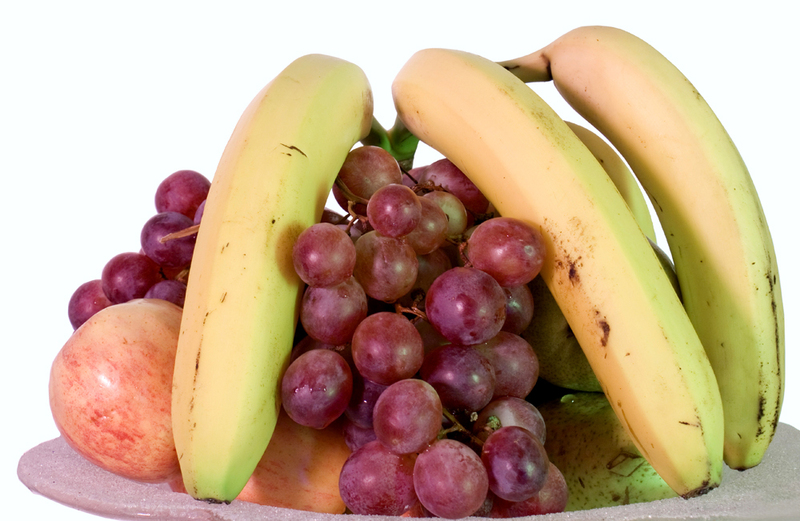 Some people even wash bananas and other fruits before peeling them… why? The fact is, yes you should even wash produce that have inedible peels such as bananas and oranges. The reason is this: As you peel them, your hands can get contaminants — such as pesticides or bacteria — on them, and this could transfer to the fruit inside. Another thing to remember is that you should wash produce immediately before serving (rather than before you put it away), because washing produce can actually shorten the shelf life of the product. 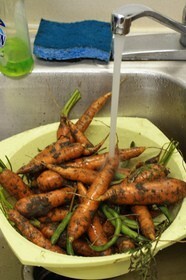 Wash and peel your garden vegetables. 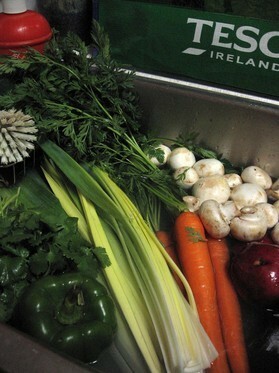 All produce should be washed very well before you eat it. The risk of contamination is greatest for crops like radishes, carrots, and leafy vegetables such as lettuce, where the edible parts touch the soil. Washing with clean water and peeling will remove most of the pathogens that can cause illness. Fully cooking the vegetables will kill any remaining pathogens. Always wash with clean, potable water. Do not use soaps or chlorine washes to wash produce. Vegetable wash products are not necessary, and have not been found to be any more effective than clean water. 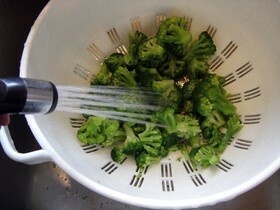 When washing or rinsing vegetables, don’t use water that is colder than the produce by 10°F or more. Following are the 5 most popular ways of washing produce. Of course, the goal is to ensure that chemical sprays, dirt and bacteria (like manure — yep, it’s even used in organic gardening!) have been removed from fresh fruits and vegetables before you eat them. 1. Wash produce by hand. This is the old tried and true way of washing your vegetables — simply putting them under the faucet and then cleaning them off with your hands. However, some experts don’t suggest this as the best method for washing produce because bacteria have a habit of getting into the grooves and folds of produce. Don’t fill your sink with water and let produce sit in there. That won’t remove dirt effectively. To remove exterior bacteria, all you need to do is rub your produce under running water with your hands. 2. Use chlorine, bleach or detergents when washing produce. Strangely, many people do this but it is not safe. The reason it’s not safe is the chemicals in chlorine and detergent can actually get into the produce (since fruits and vegetables are porous). That means, you could actually be ingesting the chlorine or detergent when you eat the produce. Experts say this is a very bad idea. These products have not been approved by the FDA for use on foods. 3. You could use special produce washes. As one way to capitalize on the contaminated produce scares, some companies have actually made their own produce washes. One such spray is called Fit Fruit and Vegetable Wash; another is called Veggie Wash. Most of these claim to be 100% safe and, in some cases, even natural. But do you need to use a product like this? I don’t think so, and neither do the experts. 4. There are even produce washing machines. This has to be my all time favorite for ways to wash your produce! While it appears that many of these machines are being built overseas and they’re rather large and industrial in nature, I can totally see how people could get sucked into thinking they needed one. Granted it’s a nice idea, but not really necessary for washing everyday fruits and vegetables. 5. Produce scrubbers are common. This is really a variation of #1 above, since it is simply using a scrubber instead of your hands under running water to get fruits and vegetables clean. However, some people swear by vegetable scrubbers, rather than just washing with your hands and water. The idea is that the scrubber makes it easier to dislodge any bacteria or dirt that might be clinging to the produce. This can be especially important for produce with a firm skin or hard rind. Ultimately, it is a personal preference as to how you choose to wash your produce. The sprays and scrubbers and specialty washes may get the job done, but you really only need running tap water and your hands in most cases. All you have to do is briskly rub your hands over the produce in order to remove dirt and bacteria. As mentioned above, with produce that has a hard rind or firm skin you can use a scrubber just to be sure that you are removing everything. You might also consider using a spray nozzle to wash your produce, since the spraying action will help to dislodge bacteria and dirt that gets into crevices.